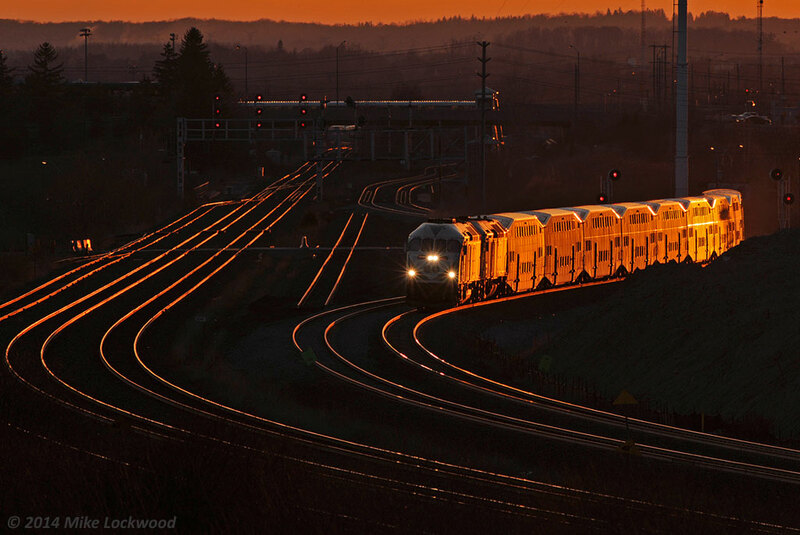 Railpictures.ca - Mike Lockwood Photo: The setting sun illuminates an eastbound GO train as it negotiates the recently opened (within the last week) shoo-fly around the South Blair Road grade separation. The new GO 660 leads 612 on a shakedown run. Shot was taken with my 300mm ‘howitzer’ hand held and manually focused, a real adventure given that this lens does not have an infinity and my eye won’t focus anymore! 2008hrs. | Railpictures.ca – Canadian Railway Photography – photographie ferroviaire Canadienne. Copyright Notice: This image ©Mike Lockwood all rights reserved. Caption: The setting sun illuminates an eastbound GO train as it negotiates the recently opened (within the last week) shoo-fly around the South Blair Road grade separation. The new GO 660 leads 612 on a shakedown run. Shot was taken with my 300mm 'howitzer' hand held and manually focused, a real adventure given that this lens does not have an infinity and my eye won't focus anymore! 2008hrs. Jesus Christ, nice shot, dude. And yet another stellar result!